Mazda for the first time released the CX-9 in 2006, however since then company didn’t introduced much changes. 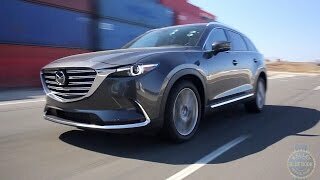 But for the recently released Mazda CX-9 2016 company has done some revision work in terms of looks and comfort. Let us have a look at the specifications and performance figures of Mazda CX-9 2016 through its review. The interior of Mazda CX-9 2016 is blend of true class. The dashboard features the same aluminum trim and the free-standing screen for infotainment. However to give the model a touch of uniqueness things get modification in the upper part of the model. The first in this queue are the A/C vents. The center stack gets touch of revision while the aluminum and wood inserts in the door panel makes it look luxurious. The steering wheel featuring the three-spokes and the instrument gauge with the same three big gauges can still be found. The major change inside the model comes with the new luxurious trim work that will give you a range-topping experience. Apart from luxury there is lot of comfort and space inside this seven-seater model. The convenience features include a seven inch touchscreen for Bluetooth connection and cable based interaction. There is also a 4.5 inch TFT screen for instrument cluster and 2.1-amp USB ports for charging your smartphones. Thus rounding up the interior details of Mazda CX-9 2016 all I would say is its gem-of-a-work. 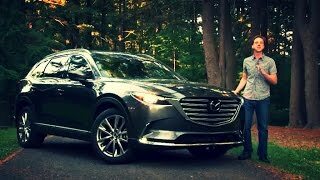 The exterior of Mazda CX-9 2016 is designed to splatter lots and lots of aggression. A part of credit goes to the Koeru Concept from which it borrows few hints. Starting with front there is a massive grille amidst the slender headlights while the bumper gets sportive look. The front end of the model looks too luxurious then you might have expected; be it the trim work, color finishing or the parts and their designs. Moving towards the rear end the taillights get a slimmer stance featuring round lights. The rear bumper and trunk lid spread sportive touch and to be said that rolling over its 20-inch wheels the model has everything ranging between luxury and sport. 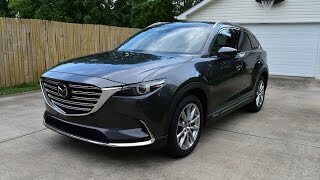 This is all as of now, while talking about the exterior details of Mazda CX-9 2016 however I believe I’m short of words looking at the mesmerizing beauty of the model. 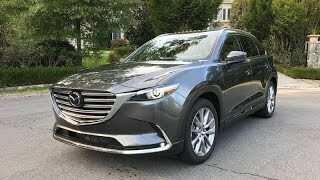 Beneath the hood of Mazda CX-9 2016 is a 2.5 liter four-cylinder engine cranking total output of 250 hp and peak torque of 420 nm paired to six-speed automatic transmission. 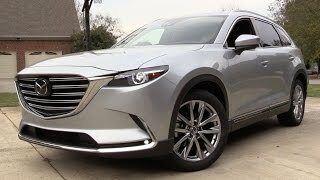 The performance figures of Mazda CX-9 2016 are still to come and we expect satisfying figures looking at the design and feature details of the model.